Sometimes I wonder if I should learn how to drive! That way, my human halves can stay at home while I drive around and meet my peeps. Since the BIG Pugsavers event, I've been a busy pug. Lots o' playdates, doggie-daycare and entertaining my human halves. Unfortunately, I haven't had much time to dictate my blog to my human. At one of my playdates with Spencer, in Clayton, we met a new pug-friend named Ernie! He's a cool fawn pug who chirps like a bird! I'm hoping he can make it to another playdate. This Saturday, if anyone wants to drop by, me and Spencer will be jowling at the Clayton dog park, about 1PM. Hi Bellatrix! You definitely need to learn how to drive. I take Mom's car all the time because I just don't want to be on her schedule. Let me know if you want me to teach you how to drive! Hey theres Lady Bells!! We've been wondering whatcha been ups too!! So goods to hear from yous!! We totally agree!! 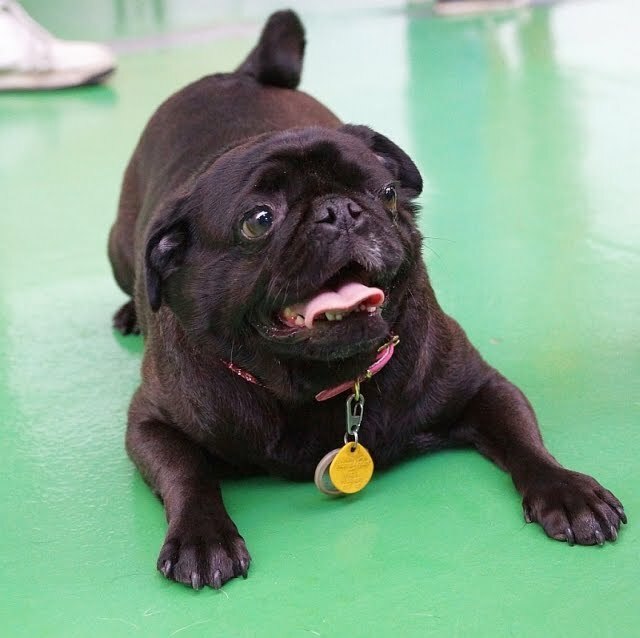 The DMV should offer a class for Pugs and quite frankly, I'm shocked they don't. Mach 5. I mean really!! I would just love to get in the car, put a couple phone books on the seats and off I go to Stubbys, but NO...Blah! 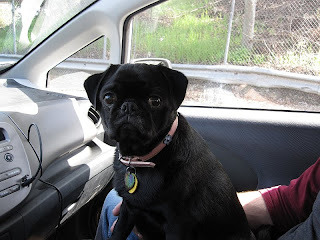 Puggies can't get drivers lic. Whatever! Josie Izzy and Anakin say hi too! Is Clayton the park with the woodchips?? Ut oh yes it is Mr. Puglet. I know you can't behave around them woodchips. Spencer's mom and I are working on finding a new park for some alternative playdates. 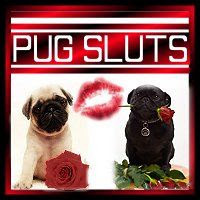 Our un-official Pug Saturdays will be held there-mom still has to get the word out-but other playdates can be rotated. Possible place in Alameda we'll be scouting out soon. So glad to hear you've just been busy. It's hard to be a woman on the go all the time. 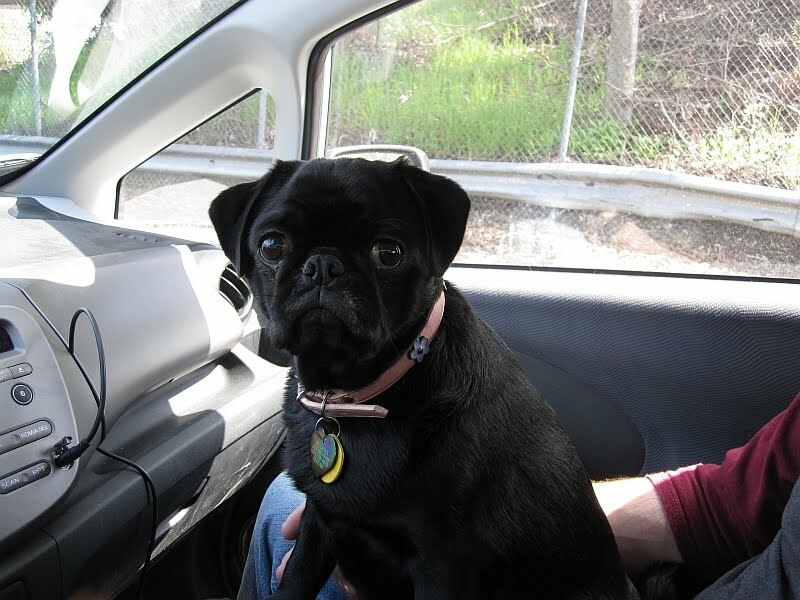 We are glad to hear you're checking out other places too, so Puglet can go. The place in Alameda looks fun but we're a little worried about if brother Dutch is too big(30 lbs & under rule). What up friends! Belly, I can't wait to see you tomorrow. I totally think we should hijack the fit for pug and go get some grass to put over the wood chips so Puglet & Brother Dutch can come hang!! Tell your daddy not to worry..I didn't mean that kind of grass.